← What Does Serviceability Mean to You? I’m a young leader at a large technology company. I moved from a bulky/heavy PC with a matching laptop bag to a 13″ MBP and wanted a bag to match. Honestly, I obsessed over what bag to get, spending countless hours looking at reviews, looking at bags in stores, etc. For some reason, I had to get this decision just right. And I did. 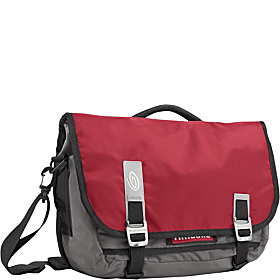 I’ve used this bag now for several airline trips for both personal (family of 5) and work. The bag has performed great. I feel my MBP is safe and I absolutely LOVE the TSA-compliant compartment. Feels great to unzip it, leave the MBP in the bag, and just run it through the xray. Takes risk/stress/time out of air travel. I have had no trouble getting all my ‘stuff’ in the bag and I think the organizational aspects are just fine. I don’t have a tablet, so I haven’t used that compartment at al. The bag and the straps feel very sturdy and of high quality. The Napoleon compartment is great for keys or an ID badge, granting really easy access. My only complaint I suppose are the clips for the main flap. They can be really difficult to clip on. I know you can use the velcro, but that can be quite loud in a meeting. I think if the loop that they latch too had just a little more slack, it would make them easier to use. I got it in the red color and I really like that. Not only does it happen to be the exact shade of red as my company’s logo, but it also offers a classy yet striking bit of color to my ‘ensemble’.